With metal being a truly global entity, it never comes as a surprise anymore to find bands working the trenches in places that one doesn’t associate with metal. But there’s always something continually enjoyable about finding a real gem among the Bandcamp crowd such as Tunisia’s Persona. Armed with all of the tools to truly succeed in the metal world, it’s just a matter of the band making a name for themselves – something they seem very willing to make the effort for based upon their debut, Elusive Reflections. Combining elements of symphonic metal, rock, some shredding solos, and powerful female vocals, Elusive Reflections is undeniably catchy, passionate, and full of songwriting usually left to a much more veteran act. Eager to learn more about the young band, we reached out and received answers from four members: vocalist Jelena Dobric, guitarist Melik Melek Khelifa, keyboardist Walid Bessadok, and bassist Nesrine Mahbouli. Read on to learn more about how the band recorded the album in their house, the trials and tribulations of starting out in a country without a big metal scene, artwork, and more. Dead Rhetoric: With so much focus on classifying bands nowadays, how would you describe Persona’s music? 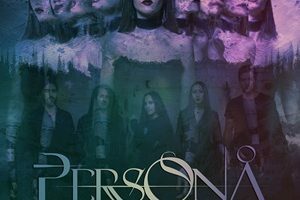 Nesrine Mahbouli: Persona’s music is something between symphonic metal and alternative metal, not specifically based on just one of these two metal subgenres but combines them both instead. So our style kind of merges modern metal sound with elements of rock, thrash and heavy riffs in addition to some synth effects and classical orchestration. And I personally think that the vocals are the component that made our music sound the most original, because for me, the blending of such types of riffs and structures with such kind of vocals is something unusual which turned out to be a very beautiful combination at the end. Dead Rhetoric: Who are some of Persona’s biggest musical influences? Walid Bessadok: I think that we’re lucky because each member of the band has his own music influence. That’s what makes the songs on our album very diverse. We can easily go from alternative metal to oriental or progressive metal. Dead Rhetoric: Much of the band’s identity seems to have some psychology in mind, from the band’s name to the lyrics. Is this a personal interest as well? Jelena Dobric: You got that right. Maybe not all of us in the band are very interested in psychology, but I surely am 😉 (I know Walid is too ;)). It’s not a professional interest, but it’s been something that has been intriguing me since my early age – the behavior of people and what’s behind it. I wanted to merge that with the thing that is my life interest – music. Dead Rhetoric: Is it true that the album was recorded in one of the band member’s bedroom? Melik Melek Khelifa: Yes 100%! The vocals were even recorded under an umbrella covered with blankets to reduce the reverb from the walls, and to decrease the noise from the neighbors living upstairs! Dead Rhetoric: Could you talk a little bit about the artwork? It started from an actual picture, correct? Dobric: It did. The original photo was made in my living room in front of a big wall mirror, and that’s what we started with. After brainstorming all together with our artist Bader Klidi about the more concrete theme and later adjustments, we came up with this result and we’re very happy with it. We wanted it to show how conflict and duality sometimes distort the way we perceive the world and ourselves. Dead Rhetoric: The band seems very intent on gaining awareness of the band on a global level. What are the goals of Persona? Mahbouli: We have recently and already achieved two of our very first goals which was the release of a first album and a music video, in which we had to work so hard to finally collect a sufficient budget despite the very few and not so well-paid gigs we played in the previous years and the political non-stability of our country, where music and “metal” more specifically are sadly neglected and an almost non-existent metal scene, it is already a great start and a very important and encouraging step for us to work even harder to gain more awareness and more self-confidence in order to aim success at an international level. Dead Rhetoric: Are you attempting to sign to a label or are you happy to continue on the independent route? Dobric: If a deal that works great for both parties – label and us – comes along, why not accept it. It would certainly make some things a lot easier for us. Dead Rhetoric: Have you found that making the album available digitally through Bandcamp and Spotify has brought some additional exposure for the band? Bessadok: With Bandcamp and Spotify, you can discover new music & bands and directly support the artists who make it. Since we made the album available digitally through those sites, many new people from different country followed us, and they support our band until now. So yes, it brings some additional exposure for the band, especially if you’re independent. Dead Rhetoric: Myrath is about the only other Tunisian band that comes to mind. How’s the overall scene on a local level? Dobric: We’re suffering from very bad conditions in Tunisia, when it comes to starting and managing a metal band. That’s not very motivating and inspiring for most of the people, but there are still some bands that are persistent enough to deal with all that. I’d first like to mention two new bands that are currently working on their debut albums, Hemlyn (progressive/fusion metal band, where Melik is also a member) and Cartagena (symphonic rock with oriental influences), and Nawather who just released their first album. Beisdes them, there’s Lost Insen (progressive metal), Ymyrgar (folk metal), Dead Men Tell No Lies (metalcore), Devil Empire (black metal). Dead Rhetoric: What are some of the issues for a young band starting out in a lesser-known country for heavy metal? Dobric: As I’ve said before, this really isn’t the most convenient country to start and manage a metal band. There are no festivals for this kind of music in Tunisia, no labels, no media support, no recording studios that specialize in rock/metal, no rehearsal studios, no venues… Everything you want to achieve takes a lot longer and it’s so much more difficult than it would be in some other country with already established heavy metal culture. A lot of persistence and perseverance is needed in order not to give up. Dead Rhetoric: What can we expect to see/hear from Persona this year? Khelifa: We are currently finishing our second music video and we have some gigs in Tunisia. We’ll get Elusive Reflections as far and wide as we can then we’ll start working on the second album.